But it’s not as big as Strayed’s monster. 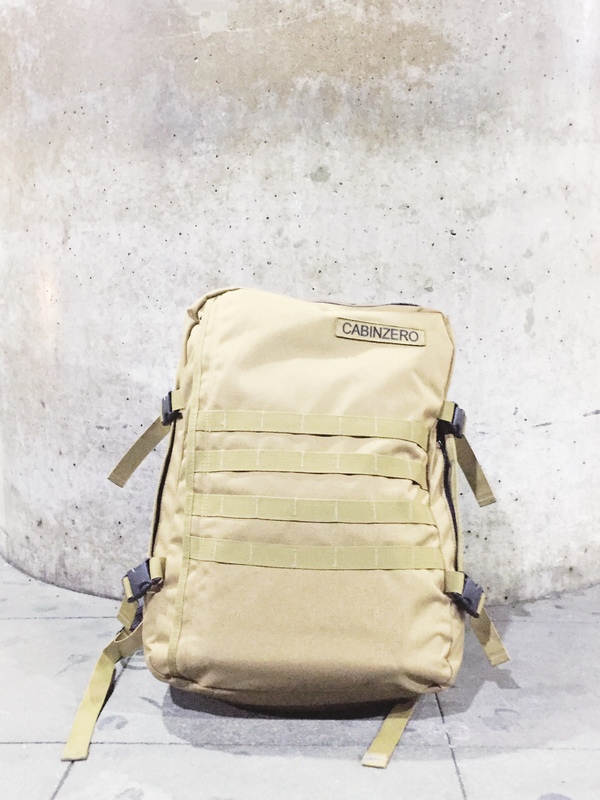 Mine is a CabinZero 44L lightweight cabin bag the color of Desert Sand. It costs about GBP 80 (PHP 4,990), under CabinZero’s Military range. 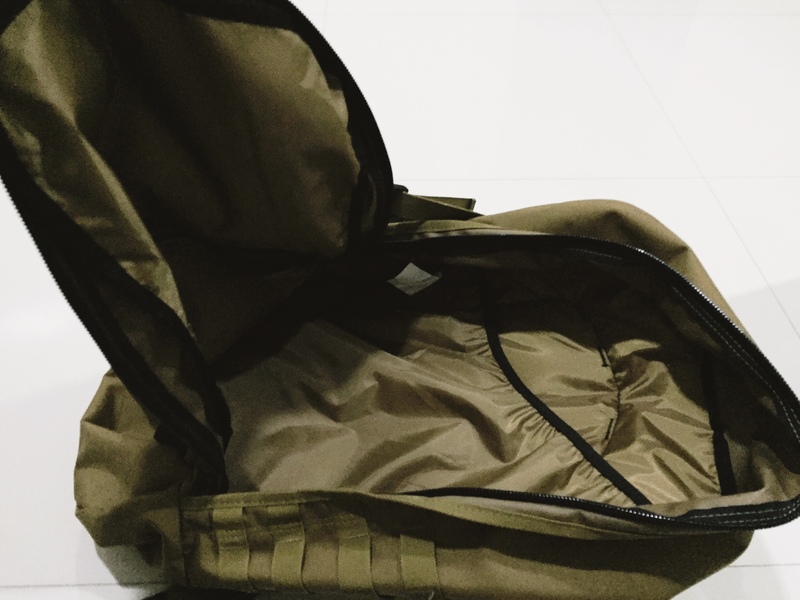 It was built with military spec nylon, has side compression straps, top grab handle, AirMesh padded back and straps, zipped pocket in the front, as well as zipped mesh pockets inside. Moreover, it has sternum and waist straps. The nylon lining is polyester, it weighs about 950 grams, the material is waterproof, and the bag’s dimensions are 55 x 40 x 20 cm. As the name of the brand implies, this bag can fit in the cabin. If that ain’ cool enough how about I tell you that it has a global luggage tracker powered by Okoban and 10 years warranty? Now I am not about to pretend that I’m a backpack expert, but I’ve had regular backpacks before and I can tell the difference between using a regular backpack that doesn’t have any of those specs to having a CabinZero that offers all those. Because seriously how many of us really think about the features of a bag and how they would make things easy for us when we use them? If I have to be honest, I buy a bag before based on aesthetics or whether or not they’d look good with any of my clothes rather than the comfort. So let’s just say that CabinZero sort of changed the way I perceived bags. Now I don’t stop at looking at the aesthetic, I also check the functionality of it. Two of the major discomforts I always experience when going on trips with a heavy load are the inevitable strains on the shoulders and lower back and the fact that the bags couldn’t fit all of my stuff (hence my 2-bag approach to traveling). Both of these have been addressed by CabinZero. The padded straps made the heavy lifting more manageable and the inside is so spacious, I was able to pack all of my things without so much effort. I like to think that I am a light packer, but really, I’m not. I always end up bringing clothes that I don’t really get to use during the trip. So I definitely appreciate the extra space inside this backpack. It’s so spacious that I was able to stuff everything in it including the travel gifts or in Filipino, pasalubong. And if we have to talk about the looks department, my CabinZero bag has no problem with it. First I am in love with the color, I have no problem pairing it with my clothes. I also like its minimalist design, no unnecessary protruding pockets, and the front looks seamless. Great news! If you too want to have a CabinZero bag, you may use my code so you can avail of the discount. Just click here to use my referral link. I was also intrigued with the color of the bag. I like the equal parts of feminine and masculine look it has. I can imagine myself using this definitely. Unbelievably, I still haven’t watched Wild. I think it’s a heavy film so I’m waiting for a time I’ll feel like watching it. Wild is a heavy movie indeed. Watching it would give you a feeling one gets when he/she is drunk. At least that’s how I could compared it to. Even so, the film is pretty great. This is something I would love to.buy for my husband. He treks a lot with our boys and some friends. He bought himself a real nice backpack but not too big enough (as compared to yours) to accommodate everything inside. I also love the color of your monster friend. Nice choice indeed. I sure do need to buy a new backpack but I guess it can wait for another month or two. I’ll check this bag out and see if it will fit my need when we go to Prague and Hamburg (probably swing by Berlin too if we have enough time). I’m never a light packer so I think this will fit my needs. Does this bag come in other colors? Thanks for sharing your code. WOW! This is looks awesome! I badly need one, Haha! Thanks for this piece! I got to know about something new today! Cheers! While the bag used in WILD was pretty huge… the one you’re using seems to be a perfect travel mate. Not too sure how people manage to carry the huge load that is, all in one bag. I’ve personally never tried something like that. I think saying that it is a military grade material, I believe the bag must be really sturdy. A few days back, I wanted a quick and urgent replacement for my camera bag. The place I was in didn’t have many shops but one shop, had the bag that I required, it offered to me a bag that was on SALE. I was getting it at half the price and so, I bought it. But, turned out that the bag hardly lasted 5 months. So in that sense.. the military grade material would definitely mean a strong and sturdy bag I guess. I want one! Need it for my up coming trip! I’m glad you found a monster buddy Marge… and he’s a he 🙂 You should give him a name… may I suggest Kulas or Baste? Woow! love the look of the bag. It is not too bulky but just the right size to carry all the necessary stuff for a couple of days. one question though, does it come with a rain cover? Hi Sindhu, nope, it has no rain cover. Looks so perfect for travel. Looks voluminous too. The color is indeed good and can go with any dress. I am in love with your monster! The informative and descriptive article about CabinZero has made me think about getting one of my own for all those adventures! Looks like a really faithful companion on travels! My boyfriend carries a Osprey Backpack everywhere he goes, and it looks a bit like yours, but in black! He’s super happy with it, because a good backpack really makes a difference while traveling/trekking/hiking ! Happy you’re happy with your Cabinzero-backpack! Love a good travel backpack! This one looks huge, so I bet its great for spending a day wandering around. You could put everything you need in here (i.e. water, laptop, jacket…).